JoniMitchell.com has been bringing you the news on Joni since the day the website went live in 1996. It's all archived and searchable here. In addition to the news, you can find an archive of "upcoming tributes and events" that have been listed on the site as well. A feature-length documentary, Laurel Canyon, is set to premiere later this year. The film, according to a press release, “will pull back the curtain on a mythical world and provide an up-close look at the lives of the musicians who inhabited it.” Alison Ellwood (History of the Eagles) will direct; the film will premiere later this year on EPIX. Among the artists who will be featured are Joni, Jackson Browne, Linda Ronstadt, the Eagles, the Mamas and the Papas, Carole King, Crosby, Stills, Nash and Young, James Taylor, the Doors, Frank Zappa and more. More information here. 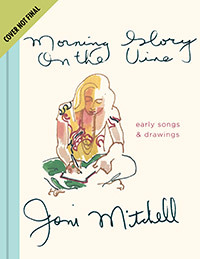 In 1971, as her album Blue topped charts around the world, Joni Mitchell crafted one hundred copies of Morning Glory on the Vine as a holiday gift for her closest friends (see original book). For this stunningly beautiful book, Joni hand-wrote an exquisite selection of her own lyrics and poems and illustrated them with more than thirty of her original paintings and watercolors. Hand-crafted, signed, and numbered in Los Angeles, the existing copies of this labor of love have rarely been seen in the past half-century. Now, as Joni celebrates her seventy-fifth birthday, Morning Glory on the Vine: Early Songs and Drawings is available widely for the first time. In this faithfully reproduced facsimile edition, Joni's best-loved lyrics and poems spill across the pages in her own elegant script. The lively, full-color watercolor paintings depict a superb array of landscapes, still-lifes, portraits of friends, self portraits, innovative abstractions, and more. All the paintings from the original book are included, along with several additional works that Joni had intended to include for her friends in 1971. Finally, the refreshed volume features an original introduction written by Joni herself. Morning Glory on the Vine is a gorgeous and intimate keepsake and an invitation to explore anew the dazzling, visionary world of Joni Mitchell. More information here. 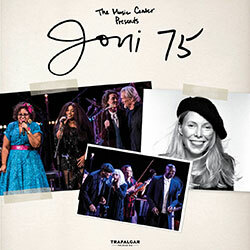 In Joni 75, artists gather to celebrate Joni's 75th birthday. The lineup features Brandi Carlile; Glen Hansard; Emmylou Harris; Norah Jones; Chaka Khan; Diana Krall; Kris Kristofferson; Los Lobos with La Marisoul, Cesar Castro and Xochi Flores; Graham Nash; Seal; James Taylor; and Rufus Wainwright. 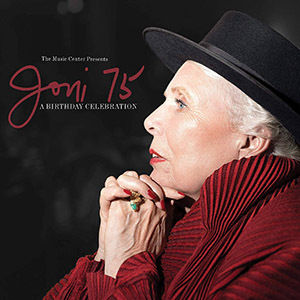 Presented by The Music Center at the Dorothy Chandler Pavilion in Los Angeles, the Joni 75 concerts were recorded November 6 and 7, 2018, with musical arrangements by co-musical directors Brian Blade and Jon Cowherd. Premieres nationwide beginning March 2 on PBS. Check local listings here. Musicians! The transcription team is expanding its reach. If you are a guitarist, a pianist, a bass player, or just someone who loves Joni's music - you can now follow the team and learn about the magic behind Joni's music. To celebrate Valentine's Day, RHINO is giving away a copy of Joni Mitchell's LOVE HAS MANY FACES on vinyl and one hardcover copy of Joni - The Joni Mitchell Sessions book by Norman Seeff. The limited-edition, 8LP boxed set is presented in a hard-bound deluxe folio package. Limited to 5,000 individually numbered copies, it includes 53 songs on eight 180-gram LPs. Etchings of Mitchell’s artwork are featured on four individual album sides, each one signifying the end of an act in the ballet. Enter to win! Joni receives Folk Alliance Lifetime Achievement Award. The International Folk Music Awards (IFMAs) was held tonight at the Fairmont Queen Elizabeth Hotel in Montréal, Canada. The Elaine Weissman Lifetime Achievement Awards are presented each year during the annual event. Recipients are determined by the voting members of Folk Alliance International and are presented to a living recipient (Joni), a memorial recipient (Leonard Cohen), and an organization or recognized academic (fRoots Magazine). Joni was not in attendance and long-time friend Eric Andersen agreed to accept the award for her. Eric got stuck on a snowbound train attempting to get to the event, and texted them his acceptance comments. They agreed to read it, but didn't do so. "I am happy to say that Joni is very grateful to receive this important award and proud as a Canadian to receive it here in this sacred city. She's sorry she can't be here to see everyone and accept it personally. To most of us, she remains the flower in the desert who could always find the truth on other people's lies and beauty in the wreckage. She remains a warrior with a stubborn streak and unrelenting stamina who could drink a case of anyone and still be on her feet!--Thank you with open hearts." See the video that Folk Alliance International created for the event. 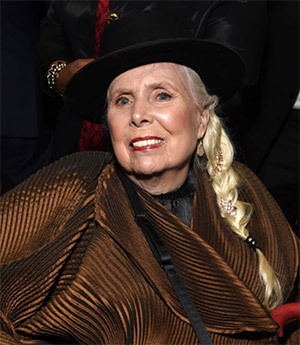 Joni made a rare public appearance last night at Clive Davis' annual pre-Grammys gala at the Beverly Hilton Hotel. Clive introduced her to the crowd, saying "I'm so touched that she comes to share the night with all of us, please welcome the inimitable Joni Mitchell." The star-studded party was attended by Nancy Pelosi, Alice Cooper, Barbra Streisand, Caitlin Jenner, Tim Cook, Brandi Carlile, Sammy Hagar, Berry Gordy, Quincy Jones, Lou Adler and many more! The Joni 75 celebration continues, even after the event is over. First, the CD soundtrack will be released on March 8. Then, PBS in the US will broadcast the event in early March. Check your local listings for times. Finally, the DVD will be available on March 29th. Rumor has it that the DVD will have many extras, including backstage interviews with the performers. It's a film so good we reviewed it twice! Our reporters Mark Scott and Sam Stone were lucky enough to preview the film and give us their takes on it. Be sure and get your tickets for Joni 75, coming to a theater near you on February 7.